As public defender, John Rodgers oversees 56 attorneys and 27 support staff members. 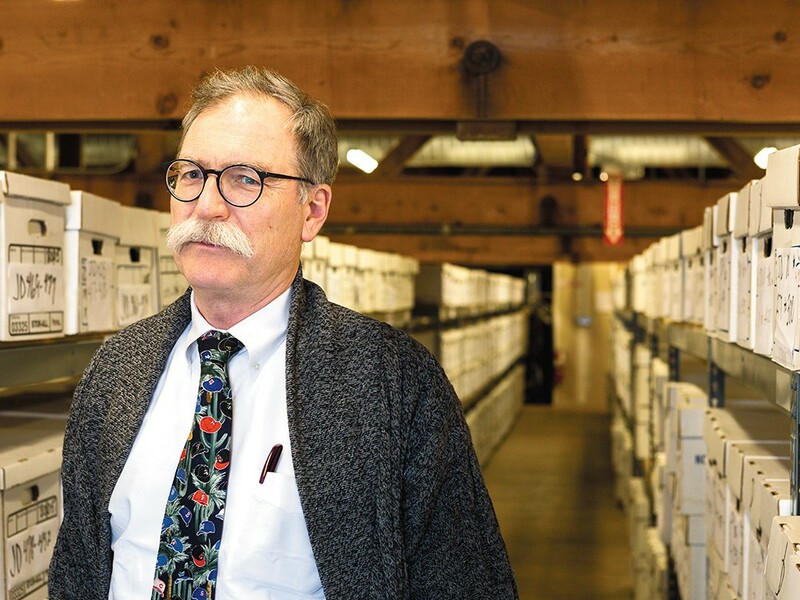 Up in the attic of the Spokane County Public Defender’s office, longtime director John Rodgers roams the packed rows of archived case files, passing thousands of old court records filled with underdog tales, painful rulings and hard-fought justice. Since his first days in law school, Rodgers has always found himself drawn to the stories behind the case numbers. When a new file comes across his desk, he will often flip first to the “facts” section just to read the colorful background information on the case. Sporting round spectacles and a thick mustache, Rodgers, 61, has long served as a passionate advocate for defendants who cannot afford legal representation. He has spent more than 35 years practicing defense law in Spokane, overseeing the county’s public defender operations for the past decade. The Spokane County Bar Association recently named Rodgers as the 2013 recipient of its most prestigious honor, the Smithmoore P. Myers Professionalism Award, named for the renowned U.S. magistrate judge and former dean of the Gonzaga University School of Law. The award will be presented at a banquet next week. On the heels of that honor, Rodgers has announced he plans to leave the Public Defender’s office at the end of this year. He loves the law and he loves the stories, but he says he’s ready for a new chapter. As director of the Public Defender’s office, Rodgers oversees 56 attorneys and 27 support staff members, including paralegals, investigators and administrative employees. The office handles thousands of indigent criminal and civil cases each year on an annual budget of about $8.4 million. But Spokane County’s top public defender almost became a bookkeeper. Raised in a conservative family on the South Hill, Rodgers went on to major in accounting and literature at the University of Washington. He says he only discovered his love of the law by happenstance. While attending law school at Gonzaga, Rodgers first joined the Public Defender’s office as a volunteer in the mid-1970s. He stayed on after graduation for several years before starting his own private practice in 1993. He returned to the Public Defender’s office as director in 2003. Rodgers says the core mission of a public defender remains the same as any defense attorney. Regardless of payment or politics, they must provide the best legal defense possible for their clients. Rodgers has argued hundreds of cases throughout his career, defending clients in several difficult death penalty cases as well as a notorious 1997 federal case against a group of anti-government militia members accused of bombings and bank robberies throughout the region. His colleagues describe him as fair-minded and hardworking. Spokane Superior Court Judge James Triplet, a longtime friend, says Rodgers has always shown compassion and integrity when representing his clients. After decades of practicing law, Rodgers says he fears the criminal justice system’s pursuit of efficiency may eventually undermine the traditional values and duties of his profession. As public defenders cope with larger caseloads, some may sacrifice face time with clients or cut mediocre deals to quickly resolve cases. “Efficiency is the enemy of due process,” he says. The system’s move toward procedure and efficiency started years ago, Rodgers says, when state legislators passed new sentencing requirements that locked in sentencing minimums for certain crimes. Now, defense attorneys primarily negotiate charges out of court to resolve cases instead of sharpening their trial skills arguing before a judge. Meanwhile, the public defender’s office has also slowly picked up more and more responsibility for handling different types of county cases. In addition to criminal cases, the office now covers probation matters, juvenile delinquency, dependency cases, mental health commitments and several other types of cases. “Unfunded mandates or creep or whatever you want to call it. … Those dockets, we shouldn’t be in on those. We don’t have the horses,” he says. The largest challenge looming for the Spokane office, as well as public defenders statewide, will be the impact of new caseload limits recently imposed by the state Supreme Court. The new standards, which go into effect Sept. 1, limit each attorney to 150 felony cases or 300 misdemeanor cases a year. Attorneys who surpass those limits may not be able to certify to practice in court. Records show the Spokane County office has averaged close to 150 felony cases per attorney, but the misdemeanor workload was more than double the proposed standard, with 645 cases per attorney in 2012. Rodgers says he hopes to develop a “case-weighting” system to define how much credit attorneys get for different cases based on time and complexity. Public defenders in Idaho face similar challenges. A 2010 report from the National Legal Aid & Defender Association states Kootenai County has struggled to fund public defense as the region’s population has increased, leaving attorneys covering excessive caseloads. The report also predicted the risk of political interference in the Kootenai office, which played out last month as the Board of County Commissioners voted to fire Chief Public Defender John Adams. He had criticized the board and recently announced he would need time off for cancer treatment. In the wake of intense public outcry, commissioners have since reversed that decision. Attorney Matt Andersen, president of the Spokane County Bar Association, says Rodgers has long advocated on behalf of those most in need of legal defense. He says the Myers award selection committee “overwhelmingly” supported him for this year’s honor. Sitting in his office, Rodgers notes he has plenty of work to keep him busy for the rest of the year. Devising a plan to accommodate the new caseload standards will be difficult enough. He also wants to strengthen the office’s training and specialty law programs. If he has time, he hopes to expand the office’s digital archiving to clear out some of the old file boxes up in the attic. Then, who knows? He says he will miss the busy pace and intensity of the office. He will miss the people and the stories. But he doesn’t plan to fully retire, so he will see where his story goes. “I’ve got a few miles left in me,” he says.